The Leap Second is added to Coordinated Universal Time to ensure the global time, coincides with the movement of the Earth. The problems occur because modern atomic clocks are far more precise than the rotation of the planet, which varies minutely in the length of a day, and is gradually slowing down, albeit minutely. Because of the differences in time of the Earth’s spin and the true time told by atomic clocks, occasional seconds need adding to the global timescale UTC—Leap Seconds. However, for astronomers, leap seconds are a nuisance as they need to keep track of both the Earth’s spin—astronomical time—to keep their telescopes fixed on studied objects, and UTC, which they need as atomic clock source to work out the true astronomical time. Next year, however, a group of astronomical scientists and engineers, plan to draw attention to the forced nature of Leap Seconds at the World Radiocommunication Conference. They say that as the drift caused by not including leap seconds would take such a long time—probably over a millennia, to have any visible effect on the day, with noon gradually shifting to afternoon, there is little need for Leap Seconds. Whether Leap Seconds remain or not, getting an accurate source of UTC time is essential for many modern technologies. With a global economy and so much trade conducted online, over continents, ensuring a single time source prevents the problems different time-zones could cause. Making sure everybody’s clock reads the same time is also important and with many technologies millisecond accuracy to UTC is vital—such as air traffic control and international stock markets. 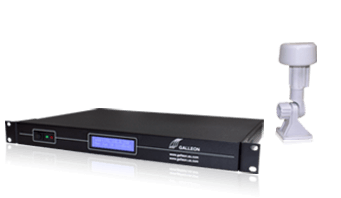 NTP time servers such as Galleon’s NTS 6001 GPS, which can provide millisecond accuracy using the highly precise and secure GPS signal, enable technologies and computer networks to function in perfect synchronicity to UTC, securely and without error.